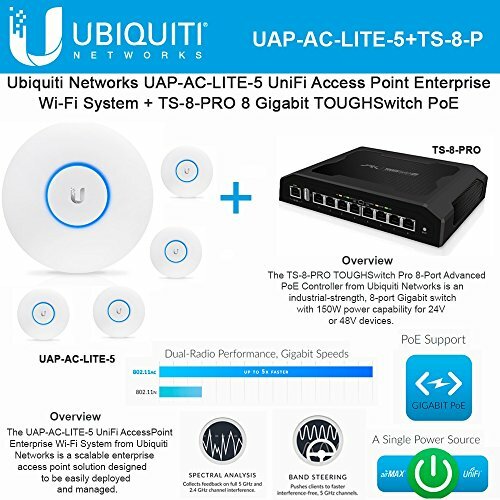 Ubiquiti UAP-AC-LITE-5 UniFi Access Point Enterprise Wi-Fi System from Ubiquiti Networks is a scalable enterprise access point solution designed to be easily deployed and managed. It supports the 802.11ac Wi-Fi standard with speeds of up to 867 Mb/s in the 5 GHz radio band, and up to 300 Mb/s in the 2.4 GHz radio band. Ubiquiti TS-8-PRO TOUGHSwitch Pro 8-Port Advanced PoE Controller from Ubiquiti Networks is an industrial-strength, 8-port Gigabit switch with 150W power capability for powering 24V or 48V devices. Ubiquiti UAP-AC-LITE-5 UniFi Access Point Enterprise Wi-Fi System from Ubiquiti Networks is a scalable enterprise access point solution designed to be easily deployed and managed. Dual band operation with 2x2 MIMO technology for each band. The UniFi AC Lite AP features the latest Wi-Fi 802.11ac technology in a refined industrial design and is ideal for cost-effective deployment of high?performance wireless networks. The TS-8-PRO TOUGHSwitch Pro 8-Port Advanced PoE Controller from Ubiquiti Networks is an industrial-strength, 8-port Gigabit switch with 150W power capability for powering 24V or 48V devices. Advanced Power over Ethernet Controllers Gigabit Ethernet performance combined with Industrial strength construction and a 150Watt power supply.